Movies are not entertainment. They're a way of life. Before VCRs and DVD players, your only choices for movies were the current theater offerings or the old movies being recycled on television. Viewing options were limited and if there was something good on TV, you scheduled your whole week around it. Now, it’s a different game. We choose movies like we choose music: to accent and heighten the flow, peaks, traumas and doldrums of our lives. Certain films must be watched at Christmas, Halloween, on the brink of baseball’s Opening Day, before a wedding, and after a graduation. Wherever you are in your life, we've got a movie for you. But where to hunt down those movies? 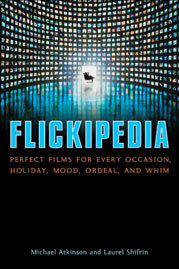 Flickipedia: Perfect Films for Every Occasion, Holiday, Mood, Ordeal and Whim! Flickipedia covers categories such as holidays, seasons, sports, marriage, retirement, illness, heartbreak, high school graduation, European vacation, Girls' Night Out and many more. With over 100 categories and more than 1,300 movie suggestions – enthusiastically written by Michael Atkinson and Laurel Shifrin, a husband-wife team of crazed movie addicts, who’ve watched nearly everything so you don’t have to – Flickipedia is an indispensable field guide to life and movies in the new century.